Most people don’t know the risks they face when they go online, especially when they’re away from home. Can you do anything about it? Yes! 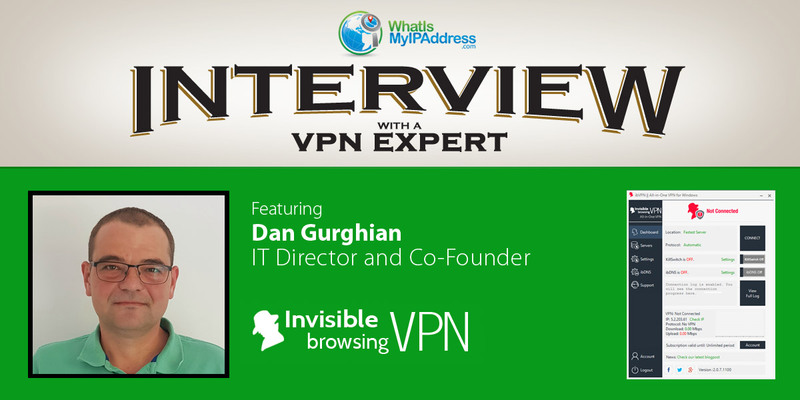 I interviewed Dan Gurghian, IT Director and Co-founder of ibVPN, and he shared great advice about online security for every Internet user. Invisible Browsing VPN (ibVPN) was launched in 2010, and from the beginning they focused on quality, Internet freedom and choice of connectivity. They are an enthusiastic and dynamic team that works 24/7 to ensure their customers have an excellent user experience. CHRIS: Online privacy is a major concern for most everyone these days. How does somebody’s IP address—which many people don’t understand—factor into their privacy? DAN: People’s awareness about online privacy is at the highest level today. People know that online activities are not always safe. Details about their private life might be leaking. There are so many examples to prove this. The real IP address is a good trace that any Internet user is leaving behind. So, protecting your real IP address (and location) is one of the steps that can improve the online privacy. VPN services (such as ibVPN) offer this protection. CHRIS: Why would you encourage everyone to use a VPN? DAN: The most important reason to use a VPN is to make sure that any activity an Internet user consider sensitive, is going to be protected. Always use VPN while connected to a network that you do not trust or control (public or shared Wi-Fi) in order to keep the communications secure, encrypted and away from prying eyes. CHRIS: Can everybody buy a VPN, or are their restrictions? DAN: We have customers from most of the countries in the world, including people from countries where buying a VPN is not legal. Those people cannot buy a VPN subscription but their families or friends from aboard help them with this purpose. We can name a few exceptions: North Korea, Turkmenistan and Belarus. CHRIS: What’s your view on free VPN services that many people look for? DAN: There is no free unlimited VPN. If you do not pay for your VPN, then your personal data and traffic are used to make money. CHRIS: What else can people do to get more privacy and protection on the Internet? DAN: They should have up to date, trusted antivirus software. Most of the products include anti-malware and anti-ransomware as well. They should look for encryption software for their devices; that way, if the device gets lost or is stolen, this is protection for their data. A well-configured home network is important. Finally, learn details about IoT (the Internet of Everything) devices that are inter-connected and might share data about you. CHRIS: What online habits should people develop to help ensure their privacy and safety? DAN: I recommend that they never keep their online sessions open in a browser. They should also use different emails addresses for different social media accounts. Do not reuse passwords and don’t use basic passwords. And if they can, they should make their communications are encrypted when they’re not connected to their home or office networks. CHRIS: How does ibVPN help ensure the security and privacy of its customers? DAN: We do many things. Some of them are implemented by default and some need user actions. With ibVPN, our users can connect using a large variety of protocols. We also offer proxy access (HTTPS and SOCKS for p2p) and Smart DNS. For example, NAT firewall is implemented on all our servers with a static IP address. This is a protection that works by default. Internet Kill Switch is implemented in our desktop applications, but our users need to enable it. CHRIS: How do your respond to what your VPN customers need or want? DAN: We listen to our customers’ needs and we adjust our development based on their requests. Based on the feedback that we have received, we can say that our customer support is top notch. TAKE CONTROL OF YOUR INTERNET EXPERIENCE AND SECURITY.